Every seat is fitted with a head restraint. The centre rear head restraint is designed solely for use with the centre rear seat. This head restraint should therefore not be installed in any of the other positions. Push the head restraint up or down in the direction of the arrow while pressing and holding button . The head restraint must click securely into position. Push the head restraint up in the direction of the arrow or push it down while pressing and holding button . 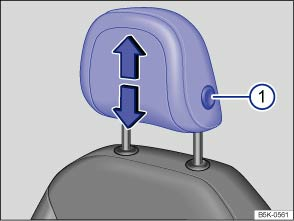 Adjust the head restraint so that its upper edge is at the same height as the top of the head, but not lower than eye level. Position the back of your head as close to the head restraint as possible. Push the head restraint all the way down, even if the head is then located underneath the top edge of the head restraint. There may be a small gap between the head restraint and backrest in the lowest position. Push the head restraint up as far as it will go. Driving without head restraints or with incorrectly adjusted head restraints increases the risk of severe or fatal injuries in the event of an accident or sudden driving or braking manoeuvre. If a seat is occupied, the head restraint for that seat must be fitted and adjusted correctly. Each vehicle occupant must adjust the head restraint to suit their body size, to help reduce the risk of neck injuries in an accident. 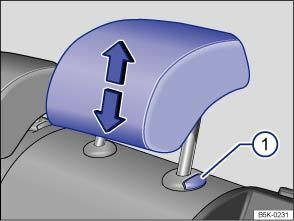 As far as possible, the upper edge of the head restraint must be level with the top of the head, but not lower than eye level. Position the back of your head as close to the head restraint as possible. Never adjust the head restraint when the vehicle is in motion.